Villa of T. Siminius Stephanus. Contrada Cività, fondo Barbatelli. Located in Torre Annunziata (today in Pompeii), Contrada Cività, Fondo Barbatelli, in front of Porta Vesuvio at Pompei. “Una stradetta divide il fondo da quello di proprietà Masucci-d’Aquino”. (See Villa 20). Located by the walls of Pompeii a few hundred metres from porta Vesuvio. C.T.P. 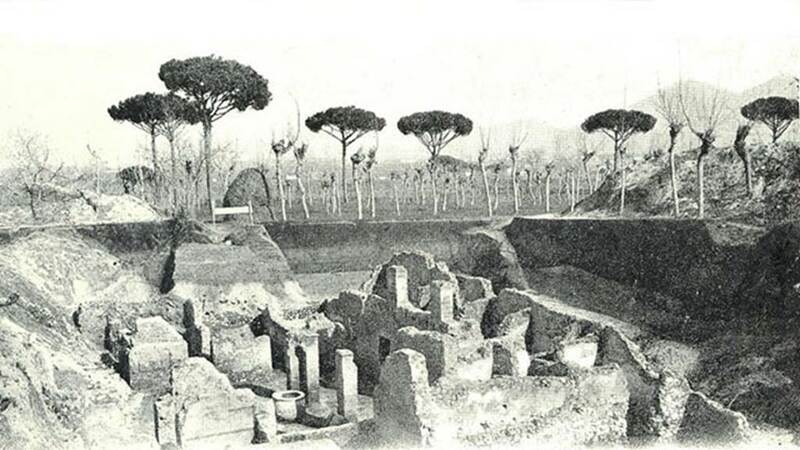 shows two villas, 20 and 21, found to the north of the Vesuvian Gate. Villa 21 was described as workshops found beneath the land on fondo Barbatelli. The rooms were described as possibly being workshops, one being a workshop where metal vessels were manufactured, and bronze statues were made and repaired. Small anvils were found here. 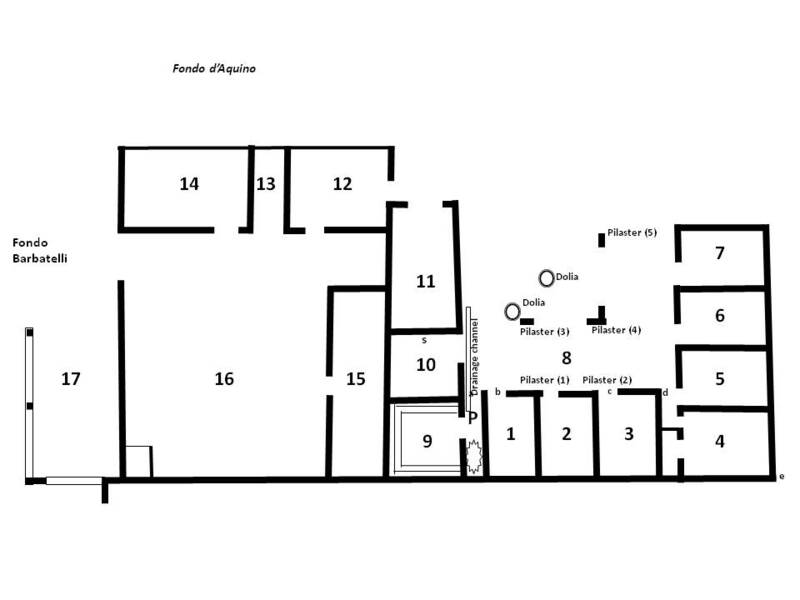 Villa 20 was described as the Villa of T. Siminius Stephanus, discovered beneath the land on fondo Masucci d’Aquino. According to Stefani, these were parts of the same villa. See Stefani in Rivista di Studi Pompeiani VII, 1995-6, p. 28, fig. 21. See Van der Poel, H. B., 1981. Corpus Topographicum Pompeianum, Part V. Austin: University of Texas. p.22 and map. Notizie degli Scavi di Antichità, 1899, p. 391, 439-448, 493-7; 1900, pp. 30, 70, 500-1, 584-7, 599-602. Carrington R. 1931. Studies in the Campanian « Villae Rusticae »: Journal of Roman Studies no. 21, p. 117 (n. 21). Day J., 1932. Agriculture in the life of Pompeii: Yale Classical Studies 3, pp. 165-208, Tav. C, n . 21. Rostovzev M., 1973. Storia economica e sociale dell'Impero romano, Firenze, 5° ediz., p. 34, nota 26, n. 21. Stefani G, 1995-6 Contributo alla carta archeologica dell’ager pompeianus: I rinvenimenti presso Porta Vesuvio: Rivista di Studi Pompeiani VII, 1995-6, pp. 11-33. Van der Poel, H. B., 1981. Corpus Topographicum Pompeianum, Part V. Austin: University of Texas, n. 21, p. 22 and map. The results of the two excavations conducted in fondo Barbatelli can be examined in detail with analysis of the finds in NdS in addition to the extracts made here. Villa of T. Siminius Stephanus, fondo Barbatelli. Photo of excavation, looking east. The postcard is dated 1902. Villa of T. Siminius Stephanus, fondo Barbatelli. 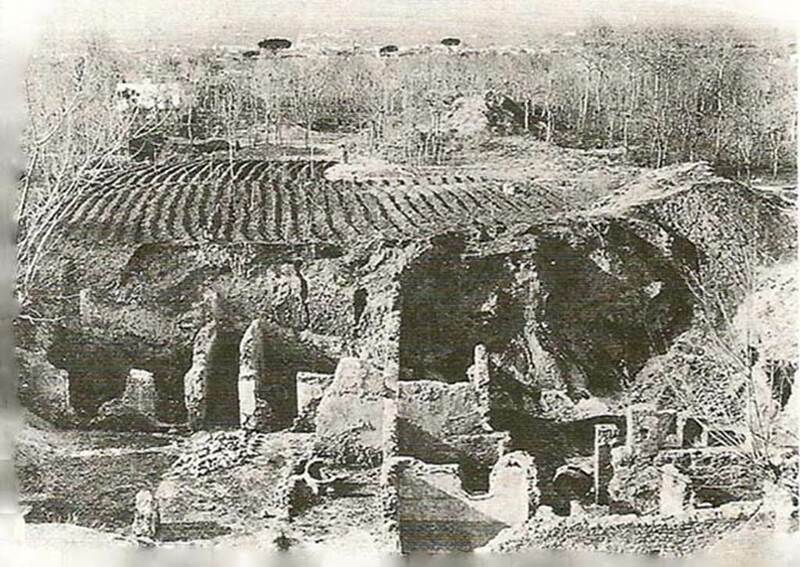 1910 excavations to enlarge the area outside of the Vesuvian Gate. Looking north towards area that the Villas 20 and 21 would have been buried beneath. See Notizie degli Scavi di Antichità, 1910, p.558, fig 2. Villa of T. Siminius Stephanus, fondo Barbatelli. 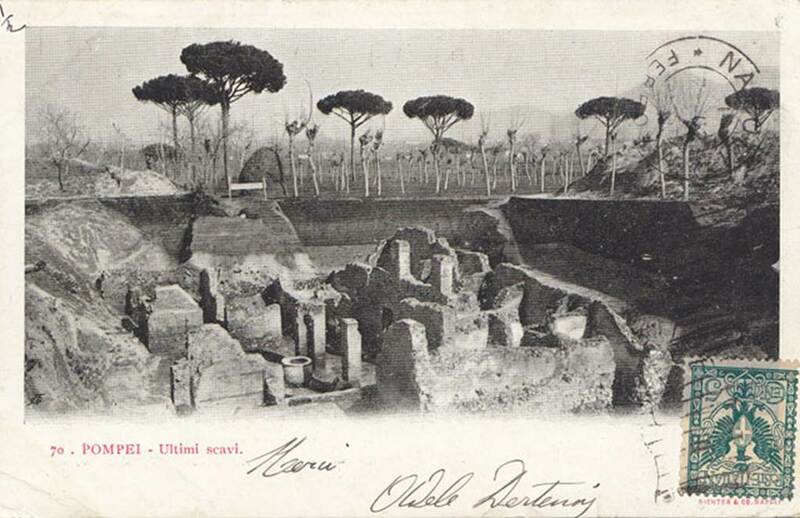 Old postcard c.1900 looking north across the villa rustica to the fondo Masucci d’Aquino. Photo of excavation, c.1900, looking east. Photo courtesy of Rick Bauer. Villa of T. Siminius Stephanus, fondo Barbatelli. The photo is titled “Fondo in cui fu rinvenuto l’EFEBO”. Photo of excavation, c.1900, looking east. The rooms found at the fondo Barbatelli were described as possibly being workshops, one being a workshop where metal vessels were manufactured and bronze statues were made and repaired. Small anvils were found here. 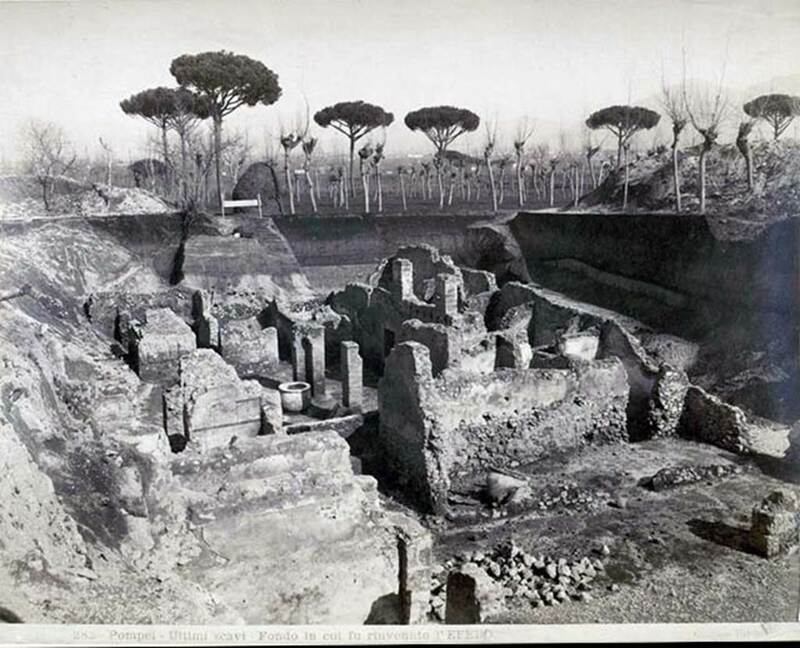 Almost all of the materials found at fondo Barbatelli were preserved at Pompeii deposits, except for some which were sent to Naples between 1900 and 1901 in separate shipments. See Stefani G, 1995-6 Contributo alla carta archeologica dell’ager pompeianus: I rinvenimenti presso Porta Vesuvio: Rivista di Studi Pompeiani VII, note 77 on page 33. Other objects found in the excavations might also have suggested a workshop for a marble worker. Mosaic was found, but not in situ, together with a deposit of marble. Stefani wrote that perhaps the explanation for the presence of more workshops in a single complex, or in both of the adjoining complexes, was that they had either been built and intended for such use, or perhaps been converted from the original residential use of the villa. She also expressed the hope that those structures covered immediately after excavation are still detectable, so that with modern detection techniques they could be investigated and accurately positioned. (see Note. 56 which dated Giornali di Scavi, from 8 – January 20, 1900). See Stefani G, 1995-6 Contributo alla carta archeologica dell’ager pompeianus: I rinvenimenti presso Porta Vesuvio: Rivista di Studi Pompeiani VII, pp. 11-33. On 25th August 1898, the purchase by the administration of the fondo Barbatelli, extending along the northern wall of ancient Pompeii near Porta Vesuvio was greeted by Sogliano with great satisfaction. Porta Vesuvio had not yet been excavated at this time, so the documentation of the time does not refer to it, but to the city walls. And the learned would know certainly that the Royal Government, who with a broad vision, have revealed a whole new program of excavations, and has authorized the Administration to proceed with the purchase of the entire fondo, that is Minervini, now owned by Mrs. Barbatelli, placed outside the walls of Pompeii between the Herculaneum Gate and that of Sarno. With the purchase of this fondo, it will not only give a solution to many topographical problems affecting the excavation of the walls, towers, gates and public streets with the adjacent tombs, but will also be able to assist with the excavation of those part of the suburbs located to the North of the city. Today the excavation opened by sig. D’Aquino at 130 metres from the northern boundary warns us that ancient ruins lie buried also under the fondo Barbatelli. It would be an unforgivable mistake to use, as in the past, that fondo for the discharge of the earth resulting from excavations, without having first explored it. And yet it is well to commend the Royal Government, which has put the fondo Barbatelli into the possession of this administration of the excavations. This puts us in position to ensure the systematic exploration, describing and noting these remains, which by luck were returned to light, and take notes, photographs and drawings that can be studied. With the hope that the new program has prompt fulfilment, I would like to close the series of my Pompeian reports for this year. See Notizie degli Scavi di Antichità, 1897, p. 534. 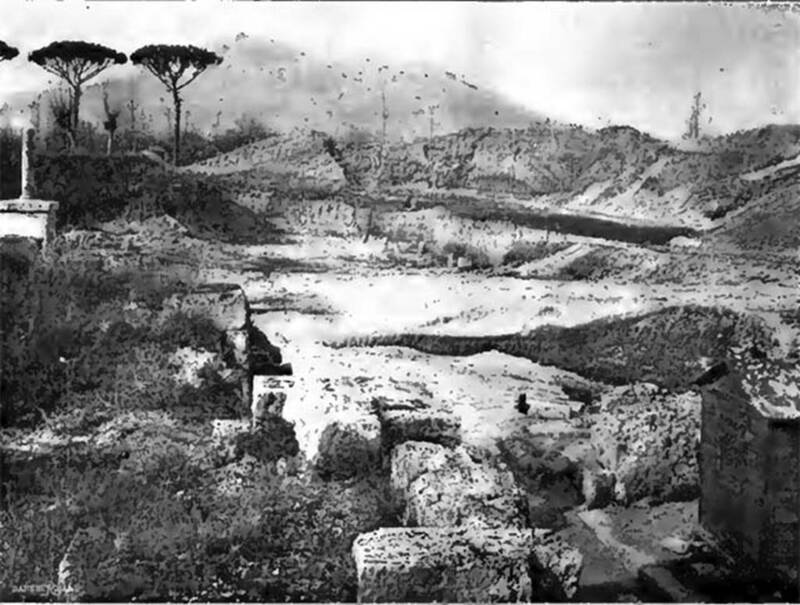 « In implementation of the new programme adopted by the Royal Government, which was worded in NdS 1897, p. 534, at an excavation outside the northern wall of Pompeii, on the 18th day of October, in the fondo Barbatelli, now state property, and precisely near to the open excavation of Ms. Masucci-d’Aquino (see Notizie 1898, p. 494 etc), whose fondo is the limit of the Government owned land. Between the top layers, on the 19th October, a bronze hinge was found ». See Notizie degli Scavi di Antichità, 1899, p. 391. Plan based on those of Cozzi and Della Valle. These differ only in secondary details. Room numbers are from a plan by Miele. See Stefani G, 1995-6 Contributo alla carta archeologica dell’ager pompeianus: I rinvenimenti presso Porta Vesuvio: Rivista di Studi Pompeiani VII, p. 22-3, p. 28, figs. 10-11, 21. On the 12th November, between the ash and the stones of a fallen wall, a large tufa phallus was found, with remains of red painted stucco. Other terracotta finds were made, as well as bronze and iron. See Notizie degli Scavi di Antichità, 1900, p.599. In the first room to the east of the latrine, on the south side of the building, more bronze and terracotta were found. At the doorway of this room, a human skeleton was found with six corroded bronze coins. Also found in the same room was an iron key. See Notizie degli Scavi di Antichità, 1900, p. 600. In the second room to the east of the latrine, on the south side of the building were found more terracotta, amphorae, four blue colours, glass, travertine, iron, and bronze. All these objects were wrapped in a cloth bag, shaped like a sack, whose traces have been preserved around the belly of an earthenware vessel. Also found here were many household items, including a rectangular table of coloured marble, a bronze tap, and two boar’s teeth. See Notizie degli Scavi di Antichità, 1900, p. 600-1. 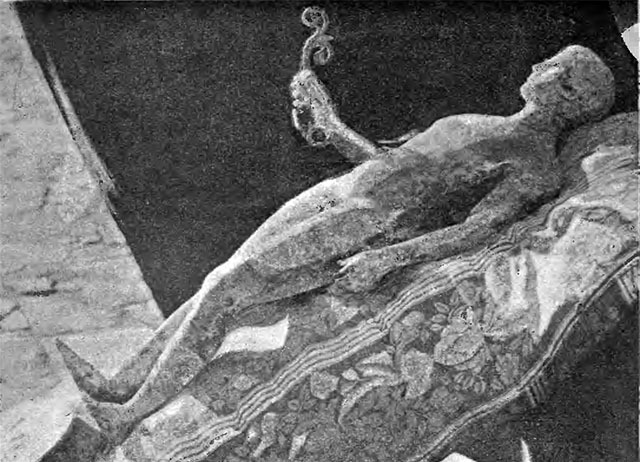 In the third room to the east of the latrine, a marble table broken into two pieces, and a marble base and pilaster with herm of a faun, together with bronze, iron, bone and terracotta objects were found. See Notizie degli Scavi di Antichità, 1900, p. 601. In the fourth room also to the east of the latrine and on the south side of the building, bronze, iron, glass and terracotta were found. See Notizie degli Scavi di Antichità, 1900, p. 601-2. According to the plan of Della Valle this area had 5 pilasters and 2 dolia. On the west side was a drainage channel. On the 24th October in the very characteristic latrine, and well preserved, evidently fallen from the upper floor, bronze, iron and terracotta items were found piled up. Colours were also found, two pieces of red, four of blue. See Notizie degli Scavi di Antichità, 1900, p.501. On 2nd November, in the same room (the latrine), where bronze objects were unearthed on the 24th of October, two large and two small bronze hinges; three hinges; three rectangular bases; two door ornaments in the form of rectangular clip; a big rim with two ears (plough?) and the top of a jar very deteriorated. At a depth of 4.80m, in the first room to the north of the latrine, a small hearth, bronze, iron and terracotta finds were made. Found near the upper mezzanine were bronze, glass, terracotta and many other items of bronze, iron, lead, wood, two fragments of cornice, and marble. See Notizie degli Scavi di Antichità, 1900, p. 599-600. The first room north of the street. Is the first room on the north side where the factory ends. According to the plan of Della Valle this area was reported verbally. Room on the west side. This is shown on the plans of Cozzi and Della Valle as a “sprofondamento” (a depression, collapse or subsidence). In the room behind the fourth room, (that is, on its north side), were found bronze, marble and terracotta items, together with, on the 27th November, the bronze statue of the Ephebus. See Notizie degli Scavi di Antichità, 1900, p. 602. According to Sogliano, the Ephebus statue in bronze was excavated in the small area behind the fourth room to the east of the latrine, located in the south-east corner of the building, that has been excavated in the pagus Augustus Felix suburbanus (fondo Barbatelli). At a height of around 0.90m from the soil level, in the middle layer of lapilli on the 27th November the statue was found, a little bent on its left side and still attached to its circular base. It had its head to the north, and behind the feet was a casseruola (saucepan). 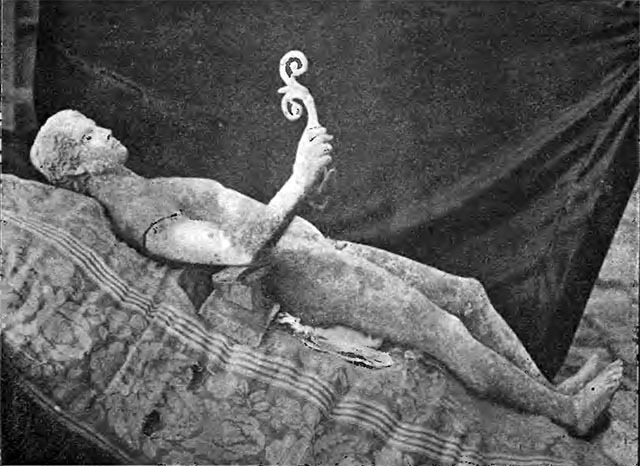 The statue was missing the right arm, the left hand index finger and the left eye; the surviving eye was made of vitreous paste. The height of the statue measured 1.17 m, without the base. At a lower level, i.e. approximately 0.25 m from the ground and at a distance of about 1.20 m. from the feet of it, toward the south-east corner, was later found the right arm with its spiral branch. Between the statue and the arm were two bronze rods that seemed to be cut branches. The index finger of the left hand was found in the carefully searched ash excavated from the area. 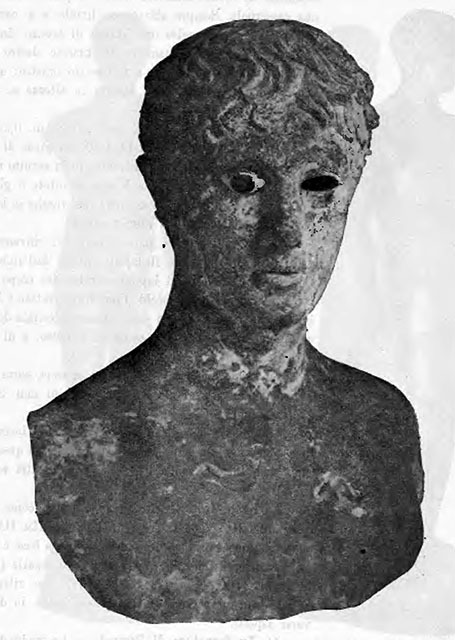 The two eyes were retrieved from the body of the statue, one entire and the other fragmented, however this was not of the same material as the surviving eye, which, as mentioned above, was of glass-paste. The base was circular, without decoration, and measured a maximum diameter of 340mm, and the height of 70mm. The walls of the room showed the effects of fire and traces of wooden fixtures fixed with nails; of these, some were still embedded in the walls, others were collected on the ground. See Notizie degli Scavi di Antichità, 1900, p. 584-7. Villa of T. Siminius Stephanus, fondo Barbatelli. Pompeii, 1978. Statue of the Ephebo. Villa of T. Siminius Stephanus, fondo Barbatelli. 27th November 1900. Left side view of the statue of the Efebo as it was placed immediately after its discovery. See Notizie degli Scavi di Antichità, 1900, p. 584, fig 1a. 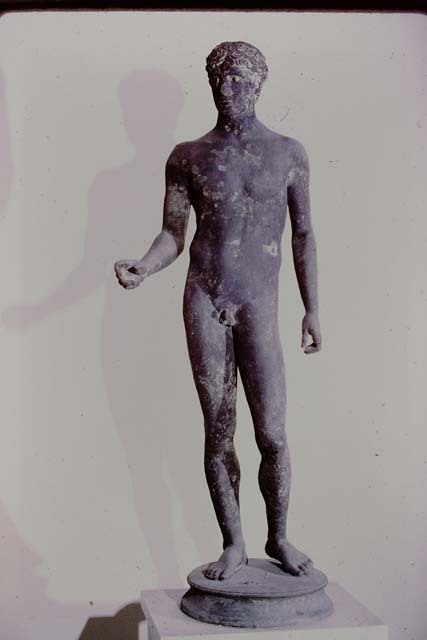 Right side view of the statue of the Efebo as it was placed immediately after its discovery. Note the right arm and scroll discovered separate but here temporarily refitted. See Notizie degli Scavi di Antichità, 1900, p. 584, fig 1b. The statue of the Efebo resting on its base and viewed from the front. See Notizie degli Scavi di Antichità, 1900, p586, fig 2a. The statue of the Efebo resting on its base and viewed from the rear. See Notizie degli Scavi di Antichità, 1900, p. 586, fig. 2b. 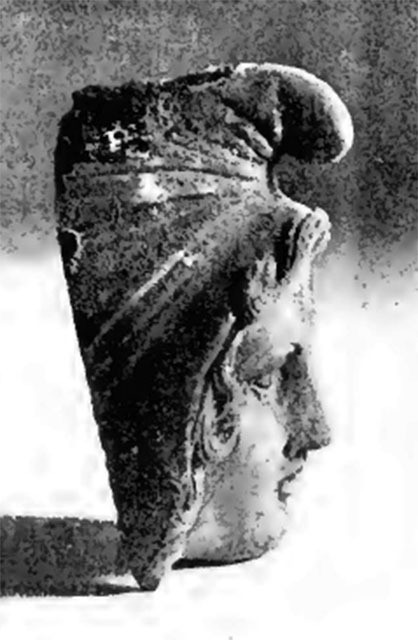 The statue of the Efebo resting on its base and viewed in profile. See Notizie degli Scavi di Antichità, 1900, p. 587, fig. 2c. 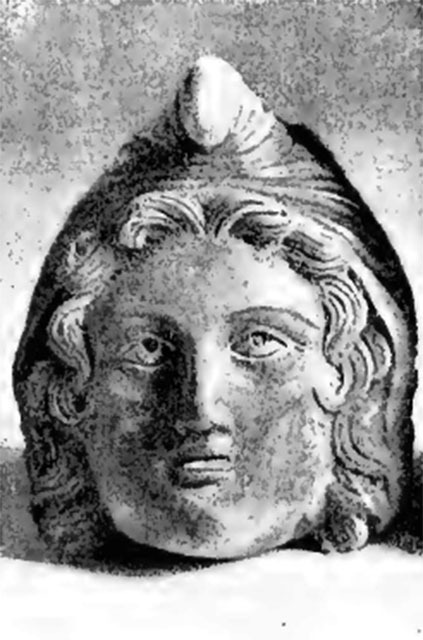 Front view of the head of the statue of the Efebo. See Notizie degli Scavi di Antichità, 1900, p. 588, fig. 3a. Side view of the head of the statue of the Efebo. See Notizie degli Scavi di Antichità, 1900, p. 588, fig. 3b. One of the two spiral arms probably to suspend something from. See Notizie degli Scavi di Antichità, 1899, p. 443, fig. 5. 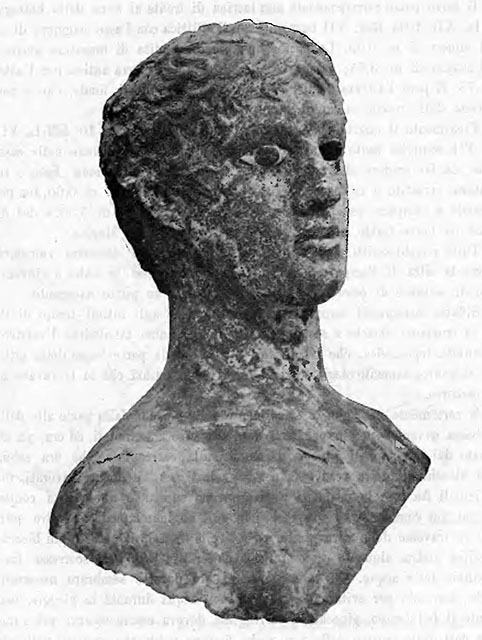 Front view of the bust of Paris wearing a Phrygian cap. On the 24th November, at a depth of 3.80m, found between the ash layers was a bronze protome of Paris, very well shaped, with Phrygian cap, ringed hair and silver eyes, whose eye-ball was made of glass paste: height 80mm. See Notizie degli Scavi di Antichità, 1899, p439, fig 1b. Side view of the bronze bust of Paris wearing a Phrygian cap. See Notizie degli Scavi di Antichità, 1899, p439, fig 1a. A small pilaster with ithyphallic herm with the head of a cupid or perhaps a small satyr, looking to the left. The head has abundant locks of hair. See Notizie degli Scavi di Antichità, 1899, p. 440, fig. 2a. Side view of small pilaster with ithyphallic herm. See Notizie degli Scavi di Antichità, 1899, p. 440, fig. 2b. A lovely lantern in the form of a small torch. The lower part of the handle was movable: length 310mm. See Notizie degli Scavi di Antichità, 1899, p. 441, fig. 3.